I love walking city streets. I have a passion for intriguing structures. So when Jeff Mansell and Ruth Keenoy of the Landmarks Association invited me to construct a walking tour of the Benton Park Neighborhood I was happy to do it for an organization that has rescued so much of the precious architectural landscape of St. Louis. It also provided me with an opportunity to research one of my favorite parts of the city and to interview residents and business people in an area of St. Louis that I’ve explored and shopped for thirty years but not really known. Newer, second-hand stores like Ruth’s Vintage Clothing and Borough Village in “Antiques Row” have replaced some of my favorite haunts for costume searches since the 1980s but the Sidney Street Cafe has stood the test of almost three decades remaining one of the most deliciously, romantic restaurants in St. Louis, and no bookstore in The Lou can match Hammonds on Cherokee Street for atmosphere and charm. Unchanged are the dramatic landscape that characterizes the Benton Park Neighborhood – streets sloping upward from Jefferson Avenue, east towards the Mississippi River – and the undulating topography of its southern sector, wrought by a warren of limestone caves. Slow to develop because of its many caves, sinkholes, clay deposits, quarries, brickyards, and three cemeteries, small dairy farms would survive in this neighborhood even after great numbers of skilled artisans arrived to work its natural resources and reside here. 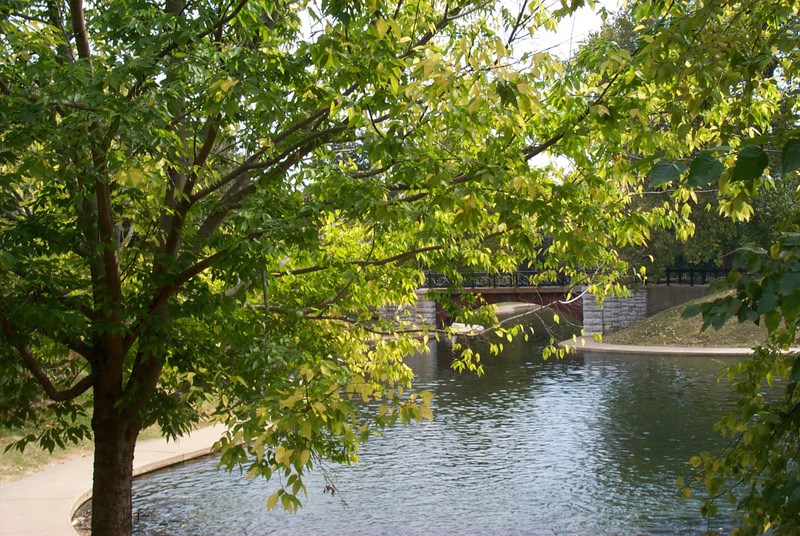 Benton Park and the surrounding neighborhood are named for Senator Thomas Hart Benton, first Missouri congressman to serve in the U.S. Senate, a post he held for thirty years. Regarded as one of the great orators of his day, Benton was also a skillful politician. He infamously shot and killed young Charles Lucas in a duel on Bloody Island in August of 1817. The obelisk in this park is not Benton’s but that of Freidrich Hecker, German immigrant and officer in Union Army during the Civil War. Harriet Hosmer’s sculpture of Senator Benton stands in Lafayette Park. 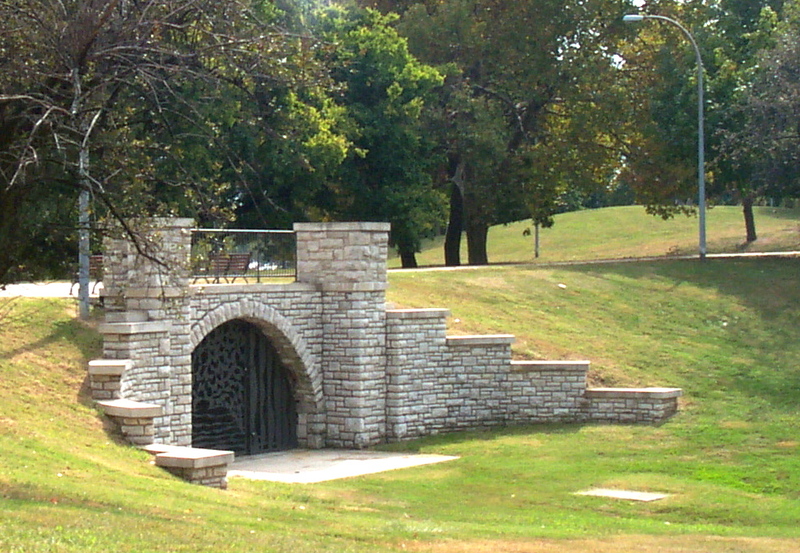 Benton Park consists of a rolling and pleasant landscape shaped by one of The Lou’s most intriguing natural cellars. Ten tunnels exit the cave beneath the park, some of which could still be accessed in the early decades of the 20th century from the cellars of neighboring shops and one public school. * Before it became a city park it served as City Cemetery. Like super-sized dollhouses of a bygone era, ruddy brick mansions fashionably line Illinois Avenue on the east end of the park. What it must have been like to grow up in one of these Queen Ann-detailed confections – with their cast-iron cresting, turrets and conical roofs, colored glass and terra cotta balconies! To look out over Benton Park on a spring morning from one of the curious, leaded-glass windows of the third-story house on the left – the park in bloom and newly landscaped by horticulturist Edward Krausnick, with an elegance and formality that rivaled Lafayette Park (before the Great Cyclone of 1896 laid waste to it) must have been enchanting. Like something out of a fairy tale. While searching five years ago for someone in the neighborhood who had been inside English Cave, I met a gentleman in his nineties, a cousin of Frank and Jesse James, who’d come up from the Ozarks to find work in St. Louis. He didn’t know Indian Cave but he showed me where the channel of a cave once used for storage, runs from the park into Anheuser-Busch Brewery. I had planned to take Indiana Avenue from Benton Park to Cherokee Street on my tour Saturday because the buildings left standing on Indiana form something of a visual timeline for the architectural evolution of the neighborhood. But having made wonderful detours – first, into the Chatillon-DeMenil Mansion (at the kind invitation of Lynn Josse) and then – into the lush gardens of the beautiful, Victorian mansion at the corner of Crittenden and Salena Streets (at the kind invitation of its owner) I needed to make up time and missed a good part of Cherokee Street’s Antiques Row and its wealth of ironwork. 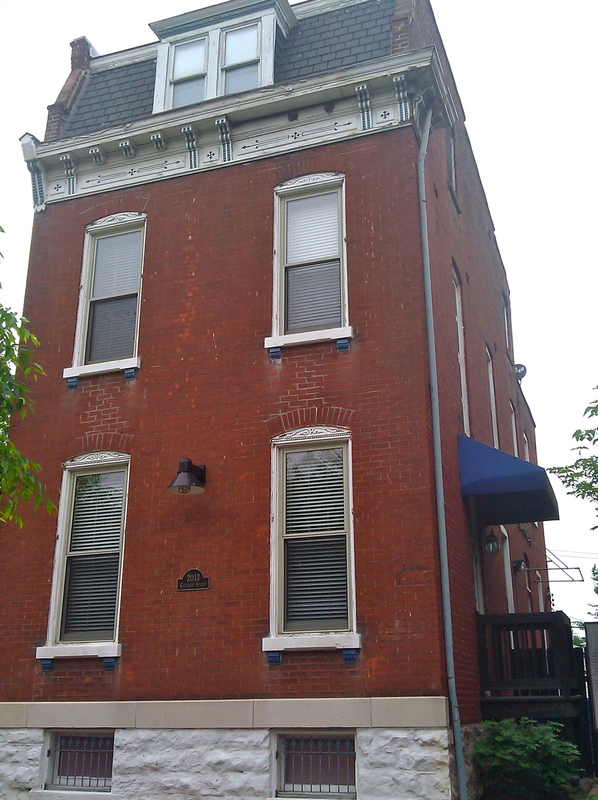 While the wrought iron balconies, shuttered windows, Mansard roofs and painted, wood cornices of Soulard seem to echo the French Quarter of New Orleans the same features in Benton Park resonate Germany, whose immigrants impacted Benton Park more powerfully than any other group. 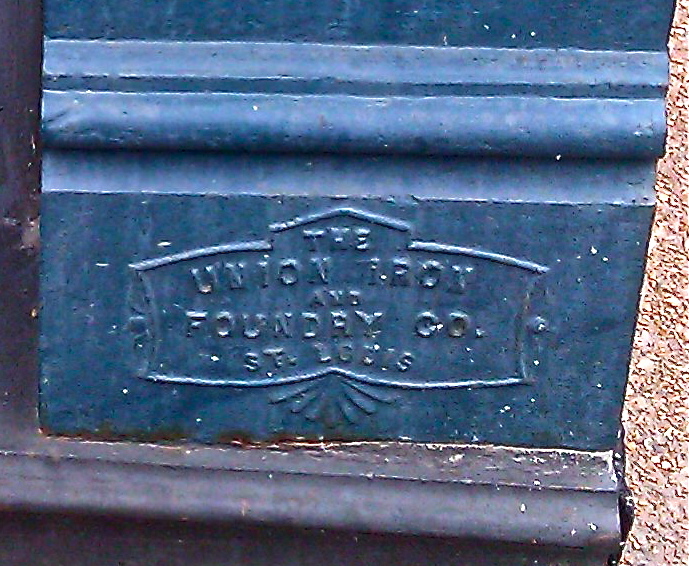 Between Indiana and Lemp Avenues alone, on the south side of Cherokee Street (which forms the southern boundary of the Benton Park Neighborhood) there are stamped metal logos of three separate St. Louis iron manufacturers. 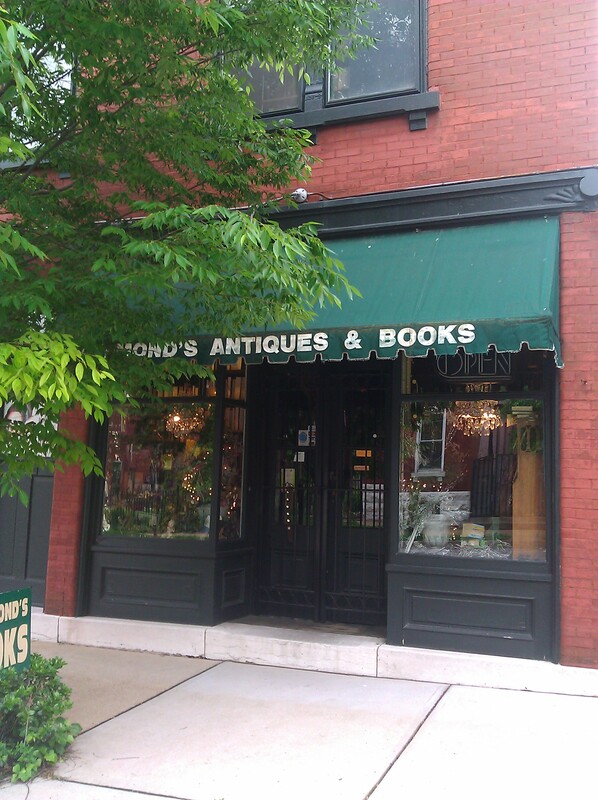 which produced the cast-iron storefront where the antique appliance store has been located for many years and Christopher & Simpson which manufactured the cast-iron storefront now housing Panorama Antiques & Folk Art. Upper Cherokee Street from Jefferson Avenue to the Ozark Expressway is one of the most fascinating streets in St. Louis, as architecturally distinctive and historically resonant as any in town. 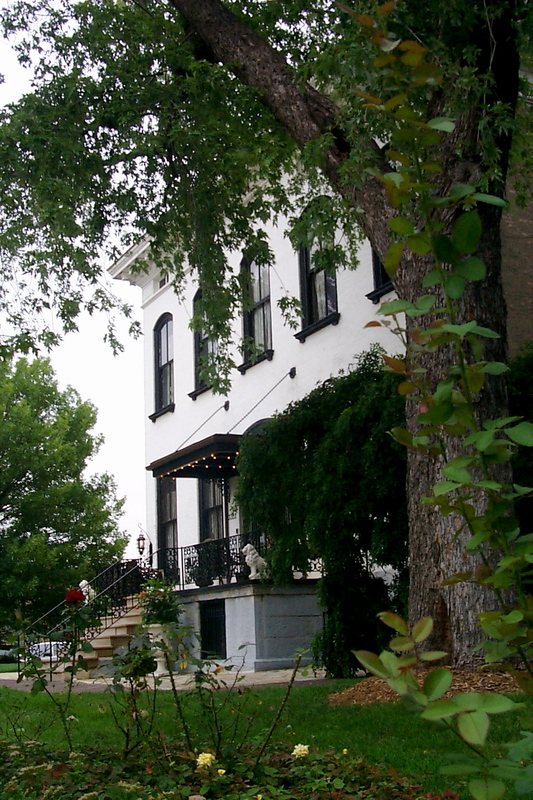 Its east end is dominated by the 19th century and its west by the turn of the 20th: three-story townhouses – some with side entrances that provided a little privacy to their residents, modest brick farmhouses, side by side with multi-storied live/work structures with cast-iron store fronts and apartments upstairs, The Stable re-invented as a brew house and restaurant, and a Federal-style farmhouse faced with a Greek Revival Mansion under which a one-time favorite St. Louis landmark, Cherokee Cave lies still and unseen. Cherokee is but one of numerous St. Louis streets named for tribal nations that enabled St. Louis to flourish as a fur trading post and become a commercial giant, fourth city in the nation according to the U.S. Census of 1890. Up and down Cherokee Street and along De Menil Place you will find signs (like the one in the yard here) that detail the history of individual buildings, their owners and occupants. These are the priceless work of St. Louis historian, NiNi Harris, whose extensive research into and writing about St. Louis landmarks and neighborhoods has personalized them, weaving them meaningfully into the broad fabric of St. Louis history. The oldest businesses in Cherokee Street’s Antiques Row like Elders Antiques, Remember Me and Hammond’s Antiques and Books date to thirty years ago when what had been a bustling shopping district in 1915 and deteriorated during Prohibition and construction of the Ozark Expressway, began it’s comeback. 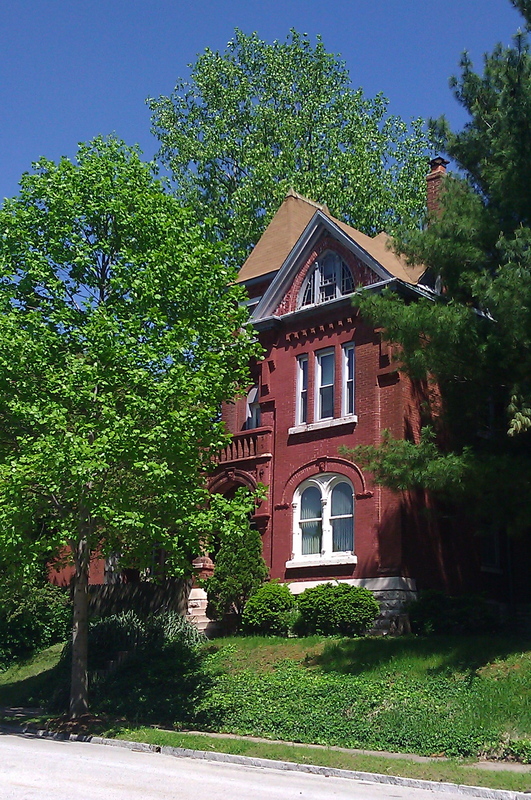 But the larger Benton Park Neighborhood wouldn’t begin to significantly turn around until 1985 when through the tireless efforts of the Landmarks Association, Benton Park became the largest National Historic District in the State of Missouri, making funding available for neighborhood improvement and revitalization. Cherri Elder and her daughter Cheyenne have their antique shop at 2124 Cherokee Street where “there has always been a furniture store”; the first, the Alt Furniture Company in 1902. 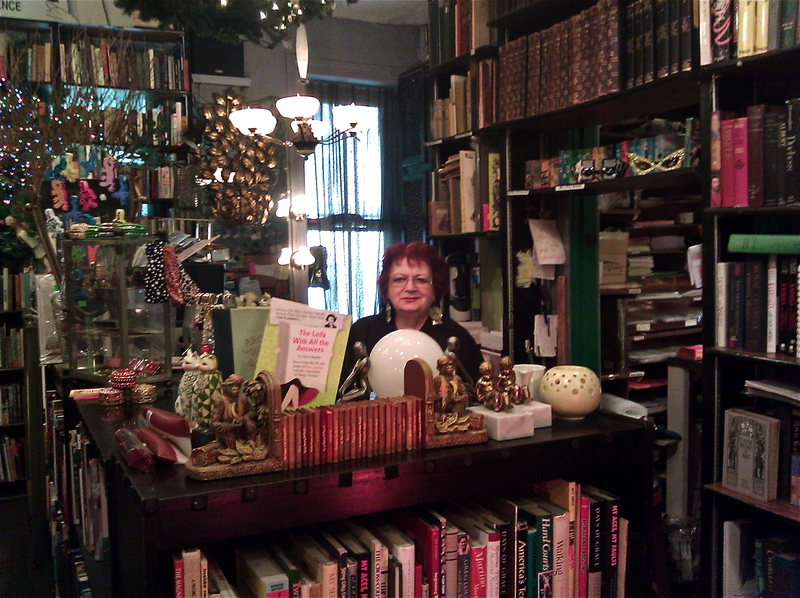 Patricia Doaran initially worked for Remember Me Antiques at 1955 Cherokee Street. She now owns it, the building it’s in and lives upstairs – which was the plan for these dual purpose investments from the beginning. Patricia told me that her building was constructed in 1891, that its first occupants were a grocery store on one side, a nickelodeon on the other and that “the first Wehrenberg Theater in St. Louis got its start here”. Jovanka Hammond opened her book store at 1939 Cherokee Street three decades ago. Originally specializing in Art Deco, Jovanka and her husband Peter now specialize in anything having to do with books (eighty-thousand of which can be found in their two-story shop). Interspersed among and above the countless shelves and stacks of books are antiques ranging from toys and vintage posters to jewelry. Peter was born in London and Jovanka in The Lou’s Soulard Neighborhood, of Serbian and Croatian parents. It’s a little like Christmas all the year round at Hammonds where the Eastern European music playing in the background establishes a warm and exotic, Old World atmosphere. I had the pleasure of chatting with them recently and Jovanka and Peter told me of a secret room beneath the main floor of their shop, finished off with brick walls, wood floor and a chute for grain. It’s believed that a former owner who worked for the Lemp Brewery used the room as a speak-easy during Prohibition. 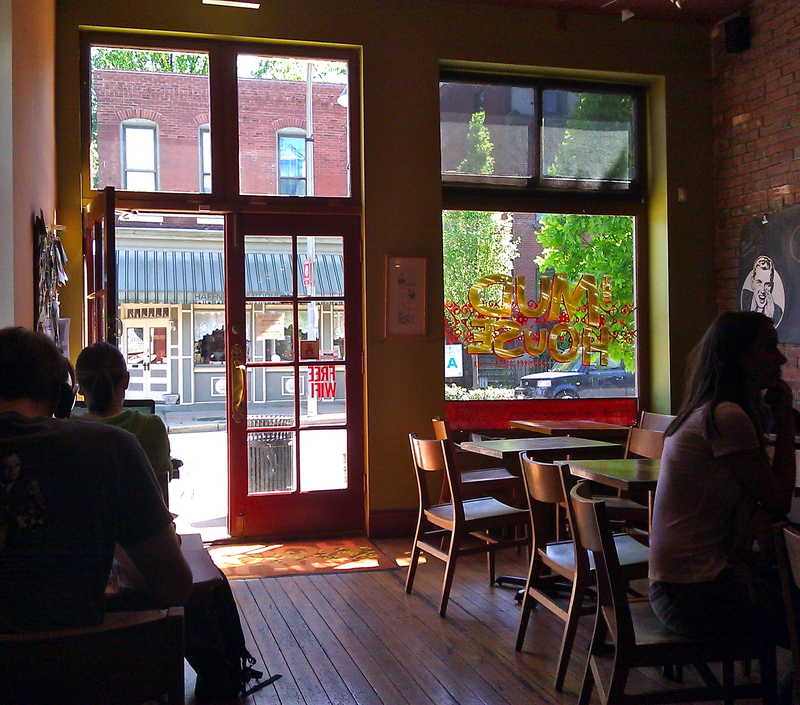 Much more recent arrivals to Antiques Row, Jeremy Miller and his wife Casey operate The Mud House at 2103 Cherokee Street – a great little cafe specializing in coffees, teas and other drinks. Breakfast is served all day long. Formerly antique dealers the Millers are now into food. Jeremy grew up with great country cooking in Louisville, Kentucky and that’s the hallmark of their cafe. They have a staff of nine, all of whom according to Jeremy, “do everything” from concocting their own marinades and salsas to doing the dishes. He loves “the diversity of the neighborhood and the Norman Rockwell-esque, Americana feel of the architecture” and Cherokee Street. They opened just two and a half years ago but they already have wide name recognition in the city. 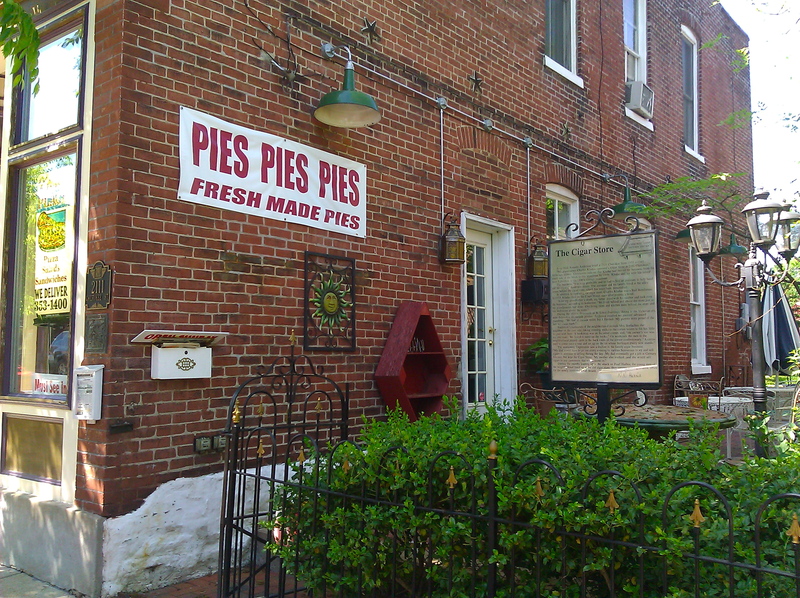 While shopping Antiques Row The Mud House makes a great stop for breakfast, lunch or early dinner. Their hours are 7:00 am-5:30 pm Monday thru Friday and 8:00 am – 6:00 pm Saturday and Sunday. Populated early on by a huge influx of German immigrants – architects, brick masons, iron workers and brewers – the Benton Park Neighborhood also included Czechs, Serbs, Irish and French. Today the socio-economic breadth of the neighborhood is wide, including a large concentration of artists, artists drawn by great buildings with amazing architectural details. 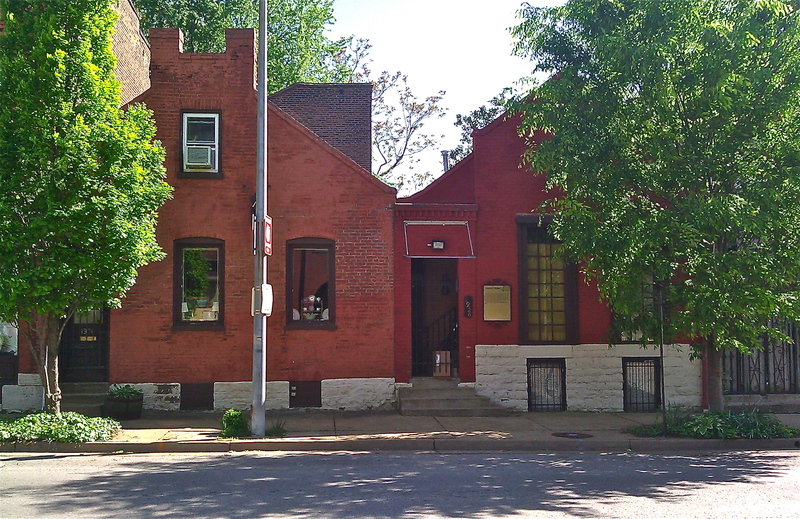 It’s little wonder that Benton Park was the first St. Louis neighborhood to create its own Arts Council. From modest settlers’ homes to elaborate mansions, the architecture and its construction reflect skill and great pride of workmanship. 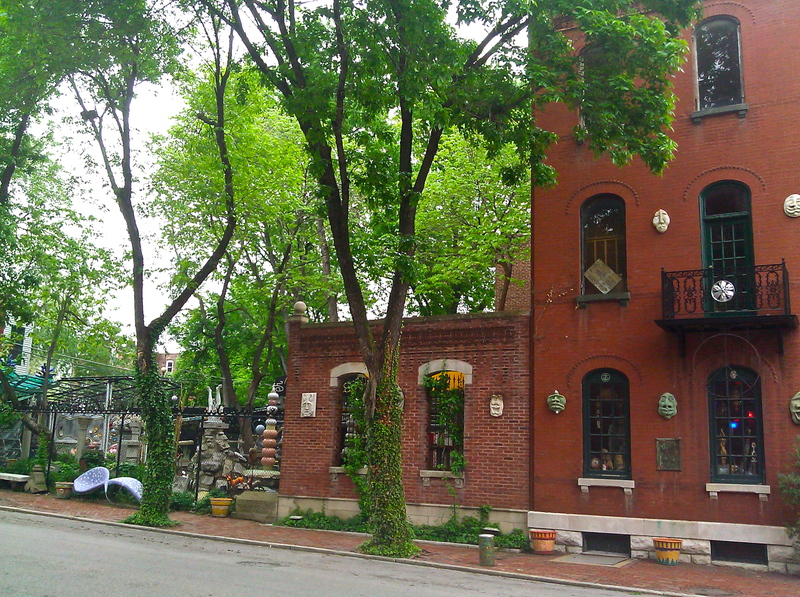 No place more dramatically embodies this artistic energy than the Venice Cafe at Lemp Avenue and Pestalozzi Street. Opened as a Caribbean coffee house in the 1980s by Jeff Lockheed and the late Paul Cuba, it became a “hub of the local poetry scene”*** and repository for Lockheed’s and Cuba’s work in mosaics and found art. They transformed a formidable, three-story, corner, work/live space into a wildly, carnevalesque venue, expanding it over time into restaurant and bar with outdoor patio. 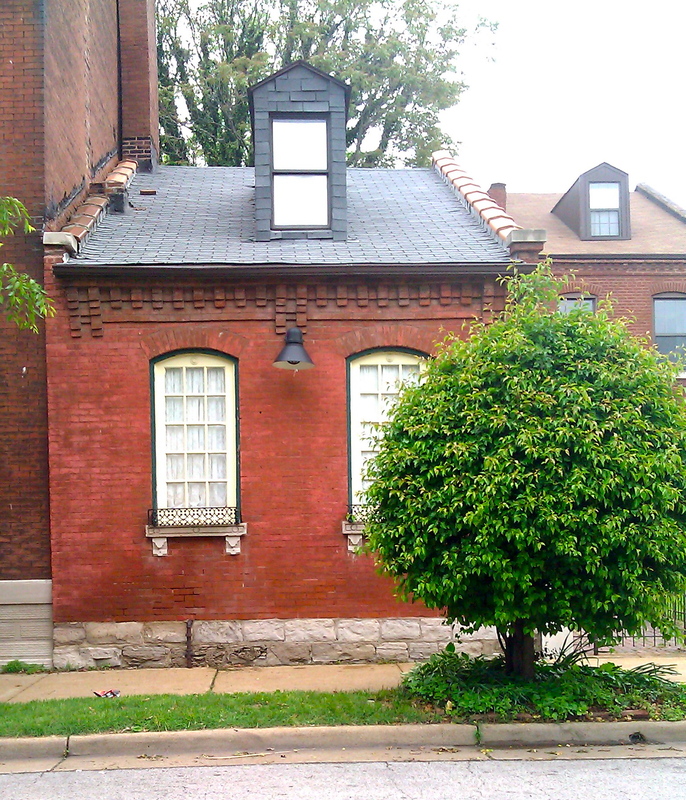 In practically every block of the Benton Park Neighborhood I’ve found remnants of St. Louis’ early architectural styles. 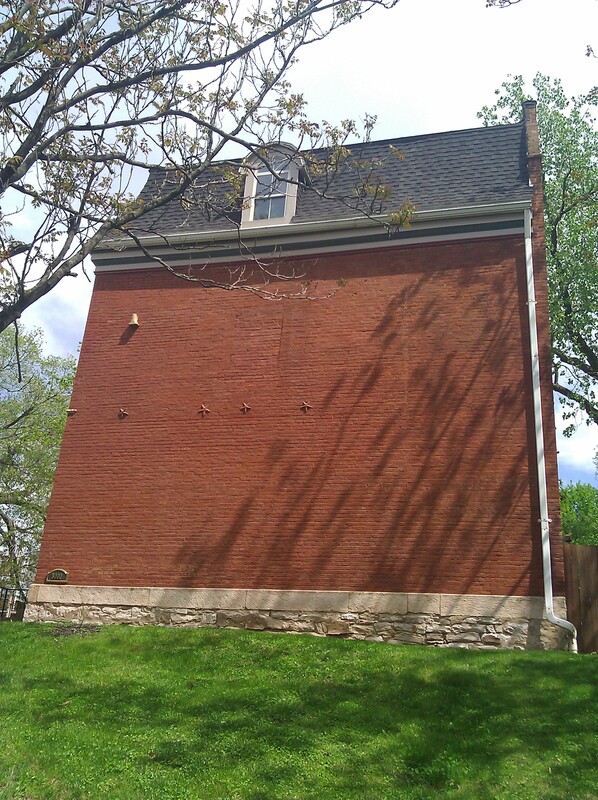 Last Saturday we viewed two such vernacular houses: a brick, Central Passage House at 2819 Indiana and what was originally a frame, Raised Basement House at 3010 Wisconsin. In addition to Cherokee three other streets in the Benton Park Neighborhood stand out in my mind for the singular personalities of the buildings they hold. One is DeMenil Place on the eastern boundary of the neighborhood with its Greek Revival and Italianate mansions, the second is Wisconsin Avenue between Crittenden and Arsenal with its Icarian landmarks, and the third is Illinois Avenue where it borders the east end of Benton Park. 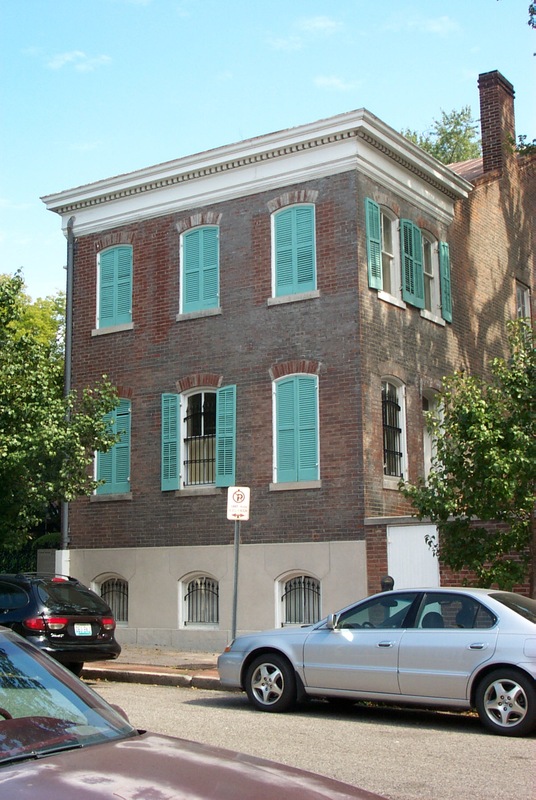 In 1848 Henri Chatillon, hunter for the American Fur Company and western wilderness guide,**** raised the four-room, brick farmhouse that stands at the northeast corner of DeMenil Place and Cherokee Street where the view of the Mississippi River would have been splendid. 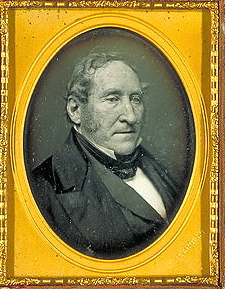 Subsequent owners, French emigre, Dr. Nicholas DeMenil and his wife, Emilie Sophie Chouteau would commission construction of a seven-room, Greek Revival mansion to front the farmhouse. Like the mansion of her uncle, Henri Chouteau, at 12th & Clark Streets that had overlooked Chouteau’s Pond, the DeMenil Mansion would have a great, white portico supported by massive, white columns and wrought iron balconies. It would also have cast-iron window guards to keep out the Yankees based at the Federal Arsenal at the bottom of the hill. Lynn Josse showed us a picture of Henri Chatillon’s first wife that hangs in a hallway of the Chatillon-DeMenil Mansion. She was an Oglala Sioux Indian named Bear Robe who died while Chatillon was guiding Francis Parkman, Jr. along the Oregon Trail. Chatillon and his second wife, Odile Delor Lux were both grandchildren of Clement Delor, the founder of Carondelet. 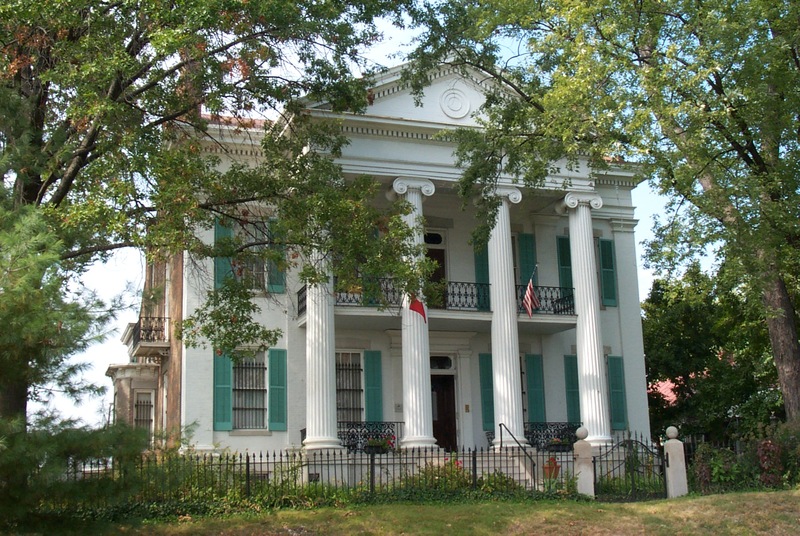 Their farmhouse evolved into a mansion, considered to be one of the finest examples of Greek Revival architecture in the Mississippi River Valley. 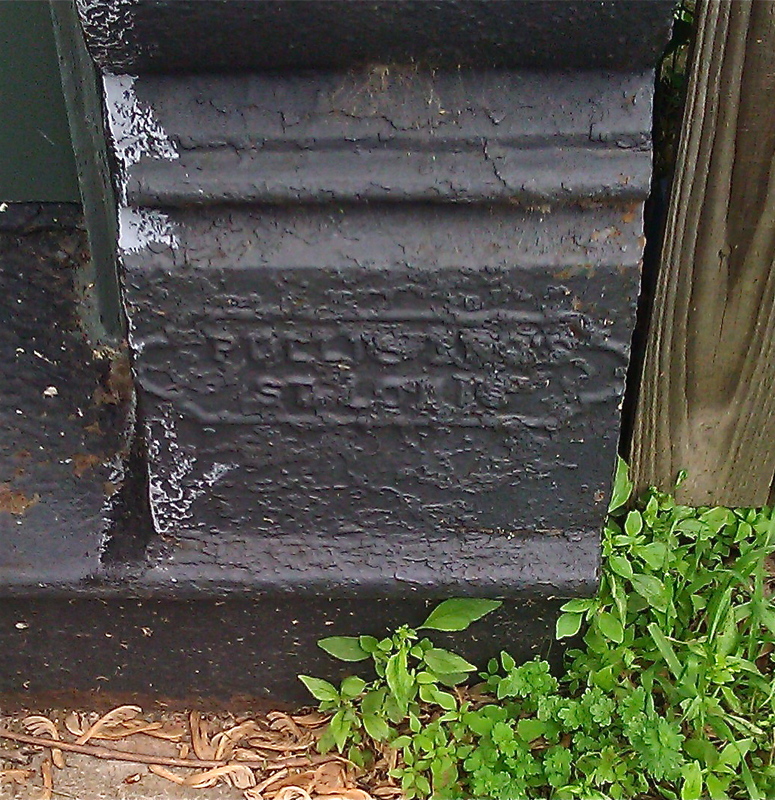 It was rescued from demolition by the Landmarks Association with the generous help of Union Electric. Next week-end, May 14th-15th the Chatillon-DeMenil Foundation (http://www.demenil.org/) is holding a Used Book Sale to benefit the museum and its educational programs. The Cafe DeMenil in the former Carriage House is a wonderful place for lunch. 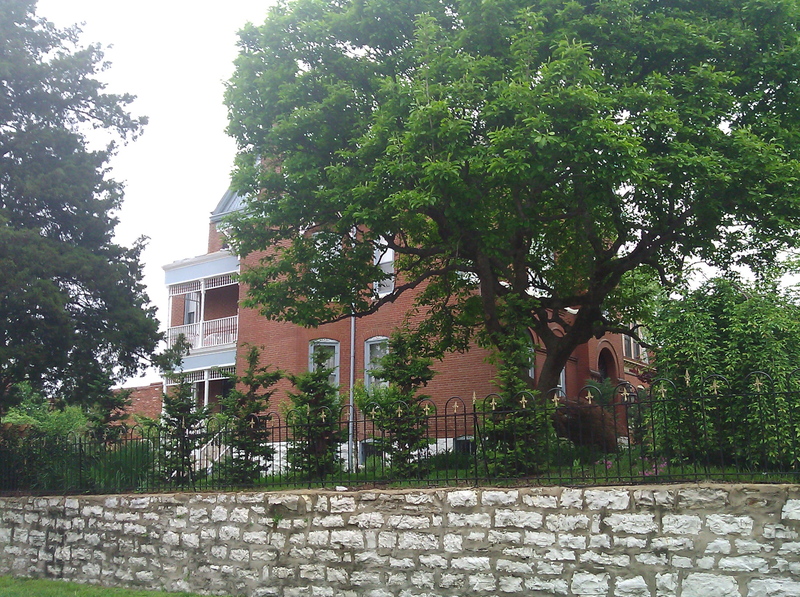 It’s next door neighbor, the Italianate mansion built by Jacob Feickert in 1868 was made famous by his Lemp descendants. The Lemps built the great Western Brewery, later known as the Lemp Brewery complex, which (with the exception of the stable on the north side of Cherokee Street) stands on the opposite side of Cherokee Street from the mansion. The Lemps could walk to work underground through a cave without having to brave snow and rain. Wisconsin Avenue north of Arsenal Street is home to three distinctive structures constructed by Icarians. The Icarians were a French, socialist group who followed founder Etienne Cabet to the United States to establish a utopian society. Members lived in communal dwellings of dormitories with shared central living and dining areas. Children were raised by the entire community. After settling first in Texas, then Illinois, they arrived in St. Louis in 1856. When their settlement on the River des Peres failed, at least twelve Icarian families moved into the Benton Park Neighborhood, three building homes on the east side of Wisconsin. Only the cottage at 3010 Wisconsin Avenue, constructed by perfumer Joseph Loiseau in 1865, seems to embody Icarian philosophy. With the exception of its two front doors, the cottage is a classic example of a Raised Basement House with a high, rubble limestone foundation – the only entry into the house from a gallery/porch on the second story, by way of an exterior staircase. 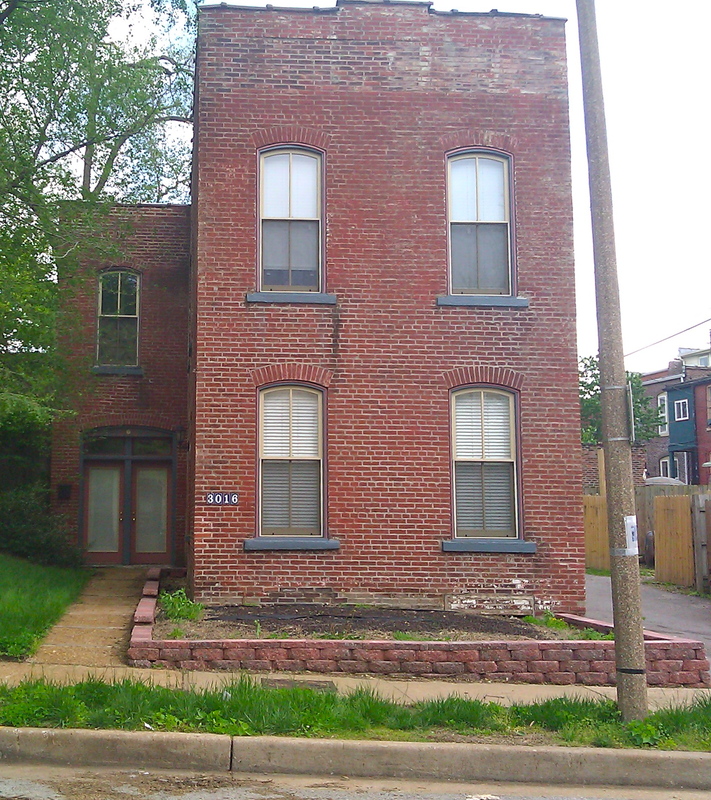 It’s been altered and added onto in the rear, but 301o Wisconsin Avenue remains a striking example of an architectural style common in Colonial St. Louis. The Icarians would have seen like structures in New Orleans before coming to the St. Louis area. 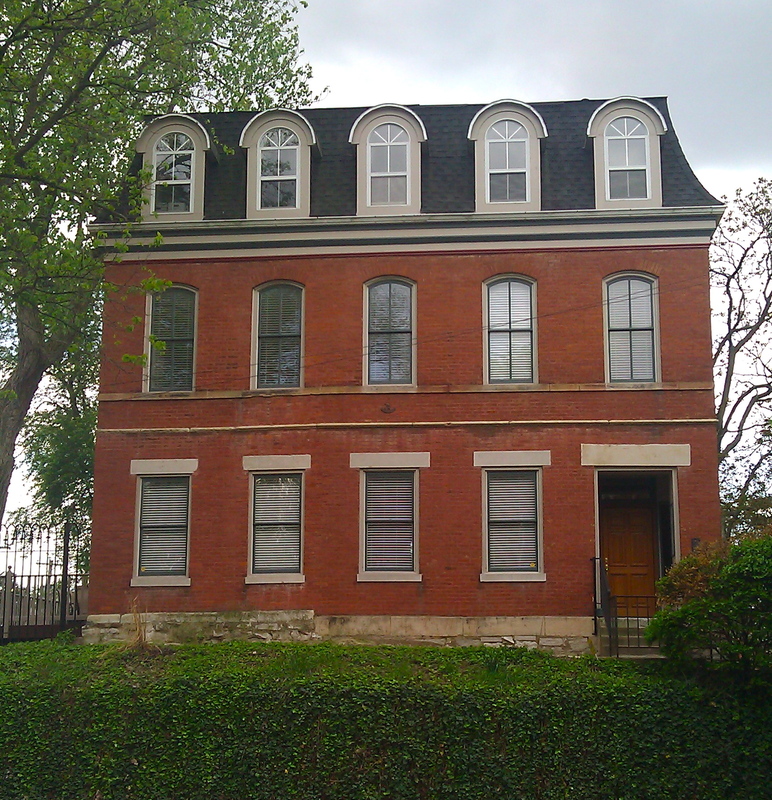 The two-story, brick house just south of it, 3016 Wisconsin, was built in the 1870s by Charles Mesnier, an architect and former secretary of the Icarian sect. It reflects a very different style and personality than its frame, Icarian neighbor. 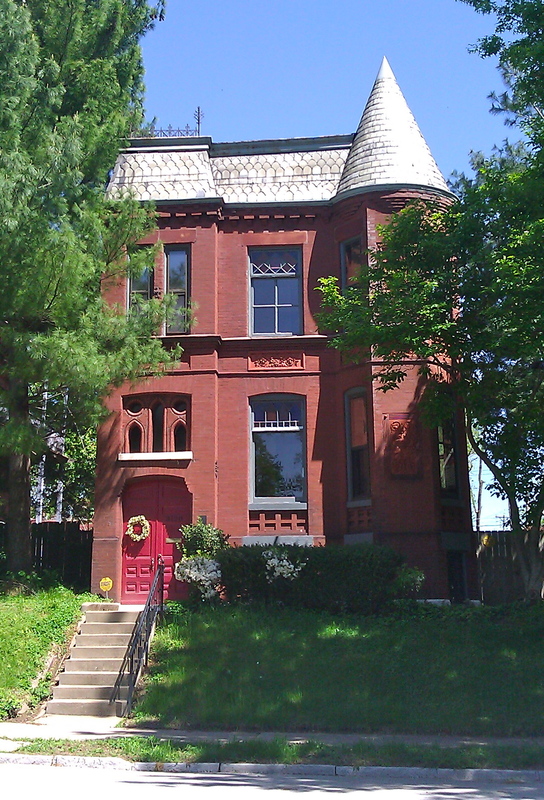 However the dramatic, three-story Victorian manse at 3000 Wisconsin Avenue stands in even greater contrast to the Raised Basement House. Situated powerfully on an elevated lot it dominates the surrounding landscape and seems an almost breathtaking departure from the communalist ideal. This is a house I would love to live across the street from and wake up to see every morning. 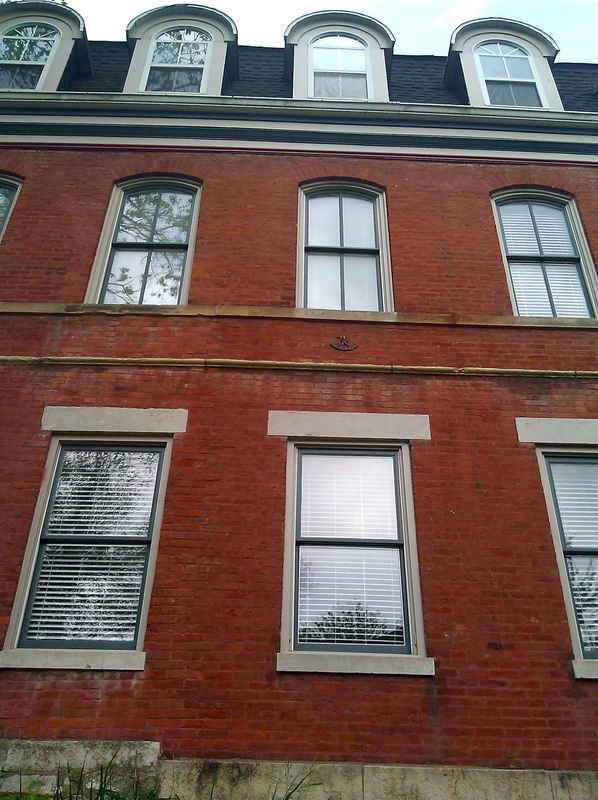 As lengthy as this blog post turned out to be, I’ve barely scratched the surface of the Benton Park Neighborhood, an area that is so historically and architecturally rich I will have to return to it many times to do it justice. I must save the Christian Schollmeyer Building, the Congress and Senate Street Apartments, Gus’s Pretzels, The Lecoutour Factory Building, The Stable, Hodak’s, Yemanji Brasil and Niche for another day, and close with my thanks to Ruth Kennoy, Jeff Mansell and Ryan Reed of Landmarks for making the trek with me last Saturday. I would like to thank also, the many ardent preservationists of the Landmarks Association who fought to keep the Benton Park Neighborhood, a remarkable segment of the City of St. Louis, alive. Photo Credits: “Thomas Hart Benton” – in the public domain at wikipedia.com; all other photos – Maureen Kavanaugh, the author of this blog. I am a walking tour and narrated coach tour guide in St. Louis, Missouri specializing in the history of the area. 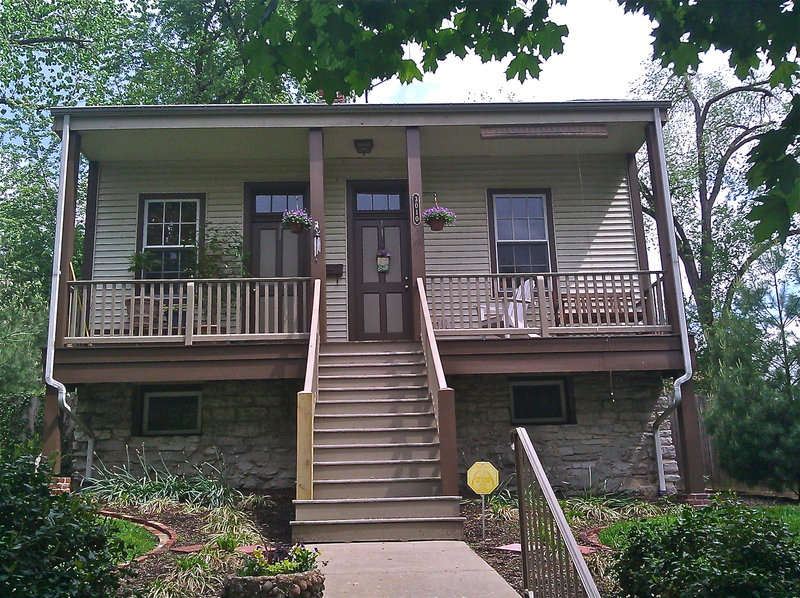 This entry was posted in Art & Architecture, Benton Park, Commentary and Criticism, Happenings, History, Neighborhoods, St. Louis and tagged Benton Park, Benton Park Neighborhood, Cherokee Cave, Cherokee Street, English Cave, Hammonds Antiques and Books, Icarians, Indian Cave, Mississippi Mud Shop, Raised Basement House, The Chatillon-DeMenil Mansion, The Lemp Mansion, The Venice Cafe. Bookmark the permalink. Love your blog. I grew up in Southern Illinois and we used to shop in St. Louis at Stix Baer and Fuller, and Famous Bar department stores when they were in old downtown. We’d have lunch at the Forum or Mrs. Hullings cafeteria. I spent many summers at my grandparents house on South Broadway. It’s good to see the old neighborhoods making somewhat of a comback and the history so well told. Keep me posted. Thank you, Sharon! I’m honored that you like my blog. And thank you for signing on to it! It seems we share some of the same happy memories of downtown St Louis. I’ll be delighted to keep you posted. I really enjoyed reading your blog. I’m interested in finding out more about the Benton Park area. I see you sited “Cherokee Street Historic Markers – NiNi Harris” is this a book or a section of a book? If so, where can I find it? Or do you have any books you would suggest me read that deal specifically with the history of the Benton Park neighborhood? The last house pictured in your post was built by my gggg-grandfather, Claude Juppier. If you have any information about the property or the Juppier family that built it, and you’d be willing to share, I’d love to hear from you! Hi, Sable, what a wonderful house! All of the information that I was able to find on your ggg-grandfather’s house I included in this blog. I didn’t even know that it was built by Claude Juppier. But I wasn’t digging deeply. I was skimming the surface so to speak of the neighborhood for a brief post. I’m happy to look around a bit. But I have 2 places , sources with whom you might check. The first is Nini Harris, a St. Louis historian, who has done enormous work in parts of old south St. Louis, particularly Carondelet and the Cherokee Historic District. The second person is Ruth Keenoy at The Landmarks Association of St. Louis. There may be information in their archives about this fascinating home. Loved your article which covered in expanse the rich history of the area. You are a treasure and valuable resource to our community! Thank you, Dennis! I’m thinking about possibilities to help this wonderful foundation beyond the writing I do to increase knowledge about and interest in it. I will be happy to contact your wife when come up with something. do you know how we can get information about Benton PARK especially about the fabric shows they had in the 70’s? I grew upin this neighborhood and too my children to these shows. Wow, Millie, I wish I did. They sound fascinating! It’s just a hunch but when Anatol’s Fabrics was still on Washington Avenue downtown (in the garment district) there was an older gentleman who owned the store – he’d be really old now – who’d been in the fabric/fashion industry all his life. He would be the kind of person with that knowledge I think. Good luck! You might also try the Missouri Historical Society Library on Skinker as something of a long shot. Hi, I used to live in the Benton Park Neighborhood and was raised there. I was born at the old Booth’s Hospital formerly at Chippewa and Marine in the Marine Villa Neighborhood. I want to name a few places (or a list) in my memory as a child which no longer exists today and haven’t for many years. Enjoy history that I witnessed as a child. Thank you for comments, Eugene and for sharing your memories of Benton Park!